The Mullumbimby mound, in New South Wales, which was investigated in 1939 by Frederick Slater, the President of the Archaeological and Educational Research Society , in Australia , has been receiving a lot of attention lately because it’s unique in Australia. The 100 metre long mound is shaped like a boomerang and it was built on marshy land as part of a complex of mounds. At each end of its summit there used to be both a northern and southern four-armed circled stone cross and with the two circles being joined by two parallel lines of standing stones. On the eastern side of the mound there’s a series of steps in between which there’s a ramp. SIlbury Hill is Europe’s largest artificial mound, situated close to Stonehenge in Wiltshire. The four-armed circled cross was a popular symbol in many parts of the Early World from the Neolithic to Bronze Age and it was often given a different meaning. It was found in all the North American Mississippi mounds and it was adopted by Native Americans as a symbol. It’s found in rock art in Mexico and in India it had religious connotations. It was carved on the rocks in Bronze age Scandinavia and ,in the form of a gold disc, it was recently discovered in a burial mound 20 miles from Stonehenge . At Carrowmore, in Ireland, there’s a 5,000 year old grave where the burial chamber is at the centre of stone circled cross and so the indications are that in this region, it was somehow linked with the Afterlife. It’s also been called a solar cross , or the Celtic Cross, and it was adopted as a symbol by the Irish Church . The Swiss psychologist Carl.G.Jung said that ‘A number of Medieval cities were founded on the ground plan of a mandala and were surrounded by an approximate circular wall. In each city, as in Rome, two main arteries divided it into quarters and led to four gates. The church, or cathedral, stood at the point of intersection of these arteries’. Jung explains that this design was based on the Heavenly Jerusalem which had God’s presence at the centre. So when I saw that this form of symbolism on the Mullumbimby mound, my immediate thoughts were ‘ how did it get there and does it have a central feature’. A representation of an ancient symbol used to represent the Pleiades, also seen in stone formations at the Mullumbimby site. The Dromberg Stone Circle is a typical neolithic megalithic sites of Western Europe, situated in County Cork, Ireland (image credit: Michael Fox, Bourne Valley Tours). The Mullumbimby Mound, which is not a typical Aboriginal site, has the hallmarks of being part of a Stone Age culture. There are hundreds of stone circles in the British Isles and there are many in Europe and Asia and a few in Africa and the Americas. The custom of building them would most likely to have been spread by contact and they appear to have served a religious purpose. There is evidence to suggest that a seafaring Stone Age people travelled around the Pacific taking their religious traditions with them. Ian McNiven and Lynette Russell relate that In 1847, George Angus reported that in the Clarence River area of Northern coast New South Wales, the local Aborigines placed a circle of stones around their burials and in the centre they placed an upright stone. 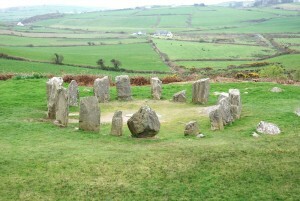 There were numerous stone circles like this in the British Isles and elsewhere in the world. There are a few stone circles, of unknown origin, on the south coast of New Guinea, and on distant Easter Island. There are many in Australia and on the Mount Elephant Plains in Victoria some of them have an inner circle. In New Caledonia 2,020 km east of New South Wales, early religious sites were surrounded by stone circles. According to Lewis Spence, ‘there are rock drawings which are similar to others in the neighbourhood of Glasgow and in the south-west of Scotland generally’. ‘For the closest parallel to the New Caledonian stone markings to be found in Scotland’, he adds ‘ is supplied by Clockno in Dumbartonshire where the wheel symbol is associated with cup and ring markings’. These mysterious holes cut in the rocks have been found in many parts of the world including in parts of the New South Wales coastal region. 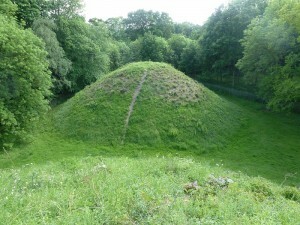 Typical neolithic burial mound, situated at Bartlow Hills in Cambridge, UK. George Angus said that there were burial mounds in the Clarence River area of Northern coast New South Wales. There was also a huge one 100 meters west of the Mullumbimby mound and there were also other mounds in the area. The custom of building them spread across the Northern Hemisphere and through North America and there were many near Stonehenge and Avebury in England . 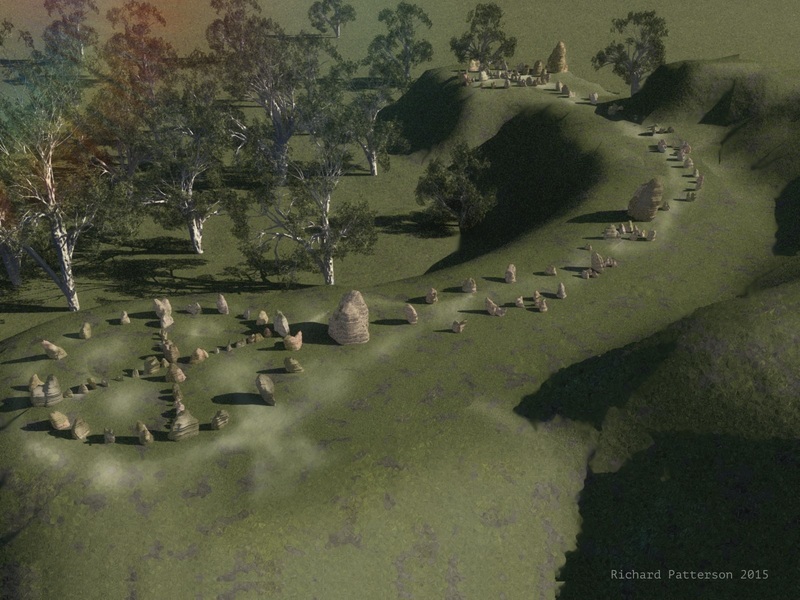 In New Caledonia 2,020 km east of New South Wales, early religious sites were surrounded by stone circles. According to Lewis Spence, ‘there are rock drawings which are similar to others in the neighbourhood of Glasgow and in the south-west of Scotland generally’. ‘For the closest parallel to the New Caledonian stone markings to be found in Scotland’, he adds ‘ is supplied by Clockno in Dumbartonshire where the wheel symbol is associated with cup and ring markings’. These mysterious holes cut in the rocks have been found in many parts of the world including in parts of the New South Wales coastal region. 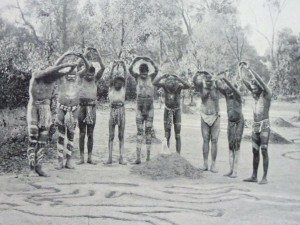 Traditional Original Australian ‘Bora men’, these were a people with strong ties to Pleiades mythology (Image credit: Customs of the World 1913). Legends, in many widely separated early cultures, told how the Seven Pleiades Sisters came down to visit Earth from the heavens. This story was also popular throughout Australia and in New Caledonia. In an Aboriginal version of the story, the seven maidens were loved by the Berai Berai brothers but their love was not returned and when the maidens returned to the sky, the fairies placed the brothers there, to hear them singing, in the form of Orion’s Belt. The lovers and the maidens were represented in an astronomical bark painting, at Yirkalla, Arnhem Land, in the form of three dots representing Orion’s Belt and, (similar to Mullumbimby symbolism}, six dots around a seventh representing the Pleiades. The latter appear to have been of significance on the ‘boomerang shaped island of New Caledonia’ which is encircled by 21 uninhabited islets known as The Pleiades of the North and the Pleiades of the South. Since there’s a circled wheel engraved on the New Caledonian rocks, could it be that an early people, in New Caledonia, followed a similar Pleiades linked religion to others at Mullumbimby ? We may never know who created the Mullumimby mound but it would appear that the Pleiades played a major role in their lives just as they did in those of other early people. The Aborigines held their New Year corroboree in honour of them, when they appeared, and they recalled that the Seven Sisters were here in the mystical era called Dreamtime. Several Native American tribes place their origin in the Pleiades and the Maya and Aztecs had calendar rounds which ended with they were seen . In Europe, the Celtic year was divided into two eras , Ist May ( The start of Spring), and 1st November,(The Festival of the Dead), each of which was regulated by these stars. Many other cultures also celebrated the Festival of the Dead on that day. In India, November is called the Month of the Pleiades. 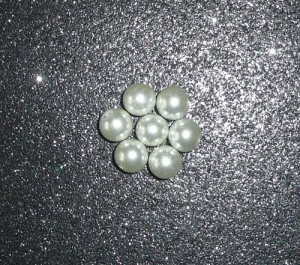 Quoting Maud Makemson, Munya Andrews relates that the Pukapukan Islanders, in the North Cook Islands, claim to be descended from the Pleiades . It’s not known if their tradition is connected with the megalithic stone circle on Penrhyn island in this Cook Islands group as old customs have not been continued. However, The Toradja, in Sulewesi, Indonesia, still build stone circles and they believe that their ancestors came to Earth in star-ships from the Pleiades. When their last king died, thousands of people came to watch his Afterlife journey to the Pleiades from the centre of a circle of stones. 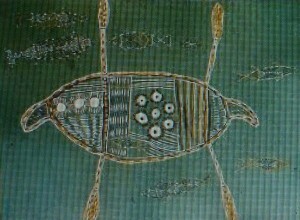 A traditional Original Australian representation of Orion and the Pleiades. The indications therefore are that the Mullumbimby mound was part of a sacred complex which was originally used by a non Aboriginal, sea-faring, Stone Age, people who visited the area many years ago and who were followers of a Pleiades linked religion. Frederick Slater said that ‘ possibly this mound was not in very remote times surrounded by water.’ If this is true, then it may have been sited on this marshy plain because the Ancients associated water with the Creation and many of them linked this with the Pleiades. Slater also stated that :‘The track setting confirms the symbols of the circles . The whole explains the journey of man through life and the immortality of his soul’, With regard to the steps ,on the east side of the mound, could it be that leaders, or priests, climbed them to the summit to celebrate a Pleiades linked festival just as other priests did on pyramids ? My thanks to Bruce Fenton for his kind help and comments. by Leonard Farra author of ‘The Pleiades Legacy – The Stone Age’, ‘The Pleiades Legacy – the Old World’ and ‘The Pleiades Legacy – The New World’, all titles are available at the Blurb Bookstore. Richard Hinckley Allen. Star Names, Their Lore and Meaning. Dover Publications.1963. Lawrence Blair with Lorne Blair. Ring of Fire. Transworld Publishers. 1988. Thor Heyerdahl. Early Man and the Ocean. George Allen & Unwin.1978. J.G.Steele.Aboriginal Pathways.University of Queensland Press.1984. University Press. 1 Art. Myth & Symbolism. Charles P Mountford. 1956. How would one go about finding information about the government destroying most of the site in the forties? There really seems to be very minimal information on this site at all. Interesting also is what other sites, if any, were similarly destroyed. Another problem which I consider to be a huge issue is the loss of ancient culture as our government further decimates what exists of aboriginal communities and their knowledge. I think many young people in Australia are much more open-minded to investigating this in the future, but it would be a crime if all we have is two hundred years of white mans recording of it. Hardly reliable.